Intro: Welcome to the Cookery by the Book podcast. With Suzy Chase. She's just a home cook in New York City, sitting at her dining room table, talking to cookbook authors. Elizabeth: Hi, I'm Elizabeth Minchilli and my latest cookbook is The Italian Table. Suzy Chase: The Italian Table is glorious, from the recipes to the photos. The first thing you see when you open the cookbook is the stunning kitchen with rustic blue and white tile, and blue and white plates hung on the wall. Is this your kitchen? Elizabeth: Oh, I wish! That's a kitchen in a beautiful castle outside of Rome. Although I've spent a lot of time in it. Suzy Chase: Oh, that tile is to die for. Elizabeth: Beautiful. And you know, a lot of the kitchen, I didn't get into all the kitchens in the book, but the particularly beautiful ones I tried to include since they're so inspirational. Suzy Chase: I can't figure out what's more beautiful in this cookbook, your writing or your photographs. What do you love more? Elizabeth: Well, you know, for me, since the kinds of books I've always done have been so image-driven, I can't imagine one without the other. And I see the photographs as giving a different dimension to the words. And that's always been my response to cookbooks, you know. I love, obviously, recipes that work, but I love the story behind them. But I also like the visual inspiration, whether it's actually the food or the place settings or the tiles on the kitchen wall. Suzy Chase: Me too. So I found it interesting that each chapter captures a specific meal that you experienced in Italy. Describe how this cookbook is laid out. Elizabeth: Well the way, I was trying to decide how to combine my competing passions for, you know, interior design and setting and history with food. And I realized that it all came together at the table. And once I decided that, I wanted to share as many different kinds of meals as possible to show my readers how Italians really eat. I mean you know, most people imagine certain dishes with Italy, whether it's pasta or pizza or gelato. But people aren't eating those things all day long, and they're not eating them perhaps in the way that people think. So while the settings are beautiful, these are really the way people eat, whether it's at the beach, whether it's on a coffee break, you know, grabbing a slice of pizza in Rome. Whether it's in a summer vacation villa outside of, in Umbria. So I wanted to have a great range and that way to be able to explore both the setting and the food on the table. Suzy Chase: Yeah, I notice that you really drill down beyond the ingredients, beyond the cooking technique. Like you'll get the pasta and the bowl, but what about the bowl, or the tool used to get the pasta from the bowl to the plate or even the linens that cover the table. I love that part. Elizabeth: Yeah, that's my ... I love that part too. And not just because it involves shopping opportunities. What I really love about it is that it really, you know, 'cause when you go to a place you might have a great meal and you might support the local restaurants, in a way, but there's other ways that you can learn more deeply about a region and that's by visiting its artisans. And you know a lot of people will see pretty, you know, ceramics from Italy and stop there, knowing that they're from Italy. But I really like to, you know, drive home why this certain kind of plate shows up if you're on the beach in Positano, why a different kind of bowl shows up if you're in a small town in Puglia, and what those mean. And explore a bit about the people who are actually making those bowls, who are often the people that are eating those dishes anyway. Suzy Chase: Here's the question I'm dying to know the answer to. How did a girl from St. Louis end up in Rome as an expert on Italian cuisine? Elizabeth: Well, that goes back to the fact that when I was 12 years old I was living in St. Louis and my parents took a vacation, and they went to Italy and they did Florence, Venice, Rome. And they came back and instead of getting back to our life they packed up our house, sold the business, and we moved to Rome for two years. And although we only stayed there for two years and then moved back to the States, we always came back in the summer. And so I always felt at home whether it was in Italy or Spain or France, trying to get a way to get back, and that way came back in graduate school. And in the late '80s I decided if I picked a, you know, my dissertation topic correctly, I could get somebody else to sort of fund my permanent vacation, and I did. And I ended up in Florence working on sixteenth century gardens. And then along the way I met my Italian husband and started having Italian babies and Italian dogs and that's when my new career really shifted gears from academia to publishing. And at the beginning I was writing predominantly about art and architecture and design, but almost really really shortly thereafter I also started writing about food. But always in a cultural context. You know, when I was writing for Bon Appetit or Food & Wine or Town & County I would write about restaurants but more, not just as a place to find good food but as a way to dive deeper into the culture. Suzy Chase: Tell me about where you live. Elizabeth: I currently divide my time between Rome and Umbria. Umbria is a region located just north, in between, let's say, Rome and Florence. And my main house is a little apartment in the old section of Rome called Monti. It's a little, I'm now talking to you from my office on the roof of our building. We've been living here, my husband had the apartment when I met him, my kids have been born here, and it's right, I mean, if I walked out, I just now walked down the street and my cash machine, my ATM, is in front of the Colosseum. Which is kind of nice. Elizabeth: And then our house up in Umbria, which is on the cover of the book, actually. We spend the summers there and have a big vegetable garden and we have olive trees so we make our own olive oil and that's where we live. Suzy Chase: How old is your house in Umbria? It looks like it's stone. Elizabeth: It's made out of stone. And the house itself is, I would say parts date back to the sixteenth century. Suzy Chase: Wow. That's gorgeous. Elizabeth: And you know, like all of these houses, they're built onto over the years, and we restored it. My husband's an architect, and his specialty is restoring these houses into inhabitable places. And in fact two of my books talk about restoring houses in Italy. Suzy Chase: Talk a bit about how the Italian food words are the hardest to tackle. Like, cicchetti, in Venice, if I'm pronouncing that correctly. What is it, and where would we eat it? Suzy Chase: Yes. You had your Awful Tour. Elizabeth: We had our Awful Tour. And it wasn't awful at all, it was wonderful. But it did deal with innards. And one of the things that we both learned, you know, we were both in Umbria, in Rome, and in Florence, is you know, the same little part of an animal can have, you know, ten different words depending where you are in Italy. And for me, that's sort of the fascinating thing. There's always something more to learn. You know, you said I'm an expert in Italian food, but I find it hard to believe that anybody's an expert. I think that there's always something to learn. Suzy Chase: Well since you brought up Melissa Clark, tell me about your food tours and your daughter Sophie. Elizabeth: So, when I first started my blog I didn't really know, you know, back in the early days of blogs, I didn't really know what it would lead to and how it would make money. 'Cause blogs don't make money. And so one of the things that it led to was doing food tours. And people started asking me for food tours and I didn't quite know what they were at the time. Nobody was really doing them in Rome. And so I started doing them, and I did market tours around several different neighborhoods in Rome on my own, and was immediately very busy doing these tours. And I was doing it on my own for a few years and then luckily my daughter, Sophie, graduated university. She was going to school in London, came back here, and I convinced her to work with me. And so now we both got sort of more work than we can handle. She's doing, handling the day by day tours here in Rome. I do some of them as well. But my time is mostly focused on our week in Italy tours. And those are deep dives into different regions. We're currently doing tours in Rome, in Florence, and in Puglia. And we do them on our own, they're usually six nights. We do them on our own, sometimes we partner with people. I've partnered with Melissa Clark twice and Evan Kleiman, who's located in LA. She's a cookbook author and host of Good Food. Elizabeth: Yeah. And then in July we're doing one with Elizabeth Gilbert, the author of Eat Pray Love. Elizabeth: Yeah. We're doing one in Puglia. So it's a fun excuse to collaborate with friends, and also see Rome and Italy in general from a different point of view. Suzy Chase: What influence did Anna Tasca Lanza and her cooking school have on you? Elizabeth: Well I just remember seeing the book really early on, you know, when I first moved to Italy, working on my dissertation. I can remember picking up the Marcella Hazan books, cooking through them, and then there were these books also by Anna Tasca Lanza. And these beautifully illustrated books. And Sicilian food at the time, even in Italy, people weren't really talking about it. And I just found it fascinating. And when I started writing about food and getting sent on press trips, I found myself at the Tasca d’Almerita estate. And seeing these pictures of the food processes that were going on in both of the houses on the estate. And there was one house that sort of focused on the wine and then there was Anna Tasca Lanza at the other villa. And I would see these pictures of like, women pouring tomato sauce on wooden planks in a sun drenched courtyard making tomato paste, and her recipes talked about these really romantic memories of the house cook sort of teaching her how to make things, and with the ingredients from the land. And it always was something that stuck in my head, and over the years I've made it back there as many times as possible and I'm really happy to recreate a menu inspired by my time there. Suzy Chase: You have a gorgeous porchetta in this cookbook. What is the key to a good porchetta? Elizabeth: Well obviously the key to any of these dishes is getting great ingredients. And the other thing is that you have to sort of, a lot of these recipes that people love are often eaten in certain places. For instance, porchetta is most likely eaten at the side of the road, you know, as you're driving through Italy there's a porchetta stand and he's got, you know, this 200 pound pig on the side of the road that he's cutting thick slices off of. I don't think anybody that's buying my book has an oven big enough to fit a pig in it. And so the challenge of my recipe was creating a porchetta that you could cook at home. And in that case it was something that would fit in your oven, have all that crispy skin, have all the nice juicy fat, but not get dried out in the middle. And so I, working with my local butcher in Umbria, I came up with that recipe. So it has all those things. And it's just super easy. Once you get the really right kind of meat, you barely season it. I mean, you season it correctly, tie it up correctly, you put it in the oven and you walk away. So, and I have to say, most of the recipes in the book are sort of, you know, not a lot of work. Suzy Chase: I can't talk about porchetta without bringing up fraschetta. Describe a fraschetta. Elizabeth: Sorry! They're all really hard. Everybody mispronounces my name, too, because the C and the H and all those things are really hard to get in Italy. So, a fraschette. Elizabeth: A fraschetta is a restaurant located in the town of Ariccia. It's south of Rome and it's known for its porchetta. And these fraschette were originally just little shops, like hole in the walls that would sell wine. And people would sit outside and to provide shade the owners would put up a few branches to provide shade, so its leaves still attached. And those are frasce. And so these places became known as fraschette, where you could go get sort of table wine. And bring your own food. Eventually these places started serving their own food, turned into restaurants, but they're still called fraschette today. And one of the places that actually, Sophie and I visit a lot, is la Selvotta in Ariccia. And the pictures in the book come from our experience there, which is one of my favorite ones because it's actually located in a leafy sort of forest. Suzy Chase: It looks heavenly. Elizabeth: It is. And the food is just, you know, it's what you want to sit down at a picnic bench and eat. It's like, mozzarella and salami and olives. And then you always have a few cooked things included. Porchetta, maybe, some sausages. It's fantastic. Suzy Chase: So last night I made some of your recipes out of the menu for a late summer dinner under the pergola. Even though it's the dead of winter here. Elizabeth: I saw that, I saw that! I saw that. You put them on Instagram. They looked perfect. Well, I have to say when people are asking me what's my go-to recipe in the book, it's the bean soup recipe. It's just so good. Suzy Chase: It's two minutes. Elizabeth: I know. It's two minutes. And people really think you put a lot more effort into it than you did. Elizabeth: I mean, if you start out with dried beans and soak them, it does become, you know. And I do suggest you do that. But I'm not gonna tell anybody if you use canned beans, that's okay. Elizabeth: But I have to say, it's a great winter recipe, but then I find that in the summer if you serve people soup they really appreciate it. It's like something they don't expect and they're sick of eating cold food. Suzy Chase: Describe the story that went with this menu, how you became a good Italian momma immediately after your daughters were born. Elizabeth: Well one of the things, one of the many things that I realized, is that being an Italian momma has lots of sort of unspoken rules. And one of them is that while you stay in the city with your kids during school year, the minute the school year ends or the weekend comes, you head out to a country house. And I don't know how it is, but everybody seems to have a country house. Whether it's your Nonna, whether it's, you know, your friends, you go out to the countryside. And so I would pack up the kids and go up to the country. And so that's where, you know, even though we live in Rome, I learned to cook a lot and entertain at our house in Todi. And you know I learned to cook, you know, meals according to the seasons as well, which is something that's, I think, really important. Suzy Chase: So moving on to my segment called My Last Meal, what would you have for your last supper? Elizabeth: You know, it has to do with place as well. So I think I would have to say, maybe a plate of carbonara at one of my favorite Trattoria, Perilli in Rome. Just because for me that sums up sort of everything. It sums up the place I would go for Sunday lunches with my family, it has my favorite waiter Valerio, it's a place that's always been there before I got there, it will exist long after I leave. And the plate, you know, the carbonara goes without saying. Elizabeth: On social media, I'm eminchilli at Instagram. And I am Elizabeth Minchilli on Facebook, and eminchilli on Twitter. And my website is elizabethminchilli.com. And I also have an app, Eat Italy, which is guides for eating your way through Rome, Venice, Florence, Puglia, Umbria, and more and more cities every day. 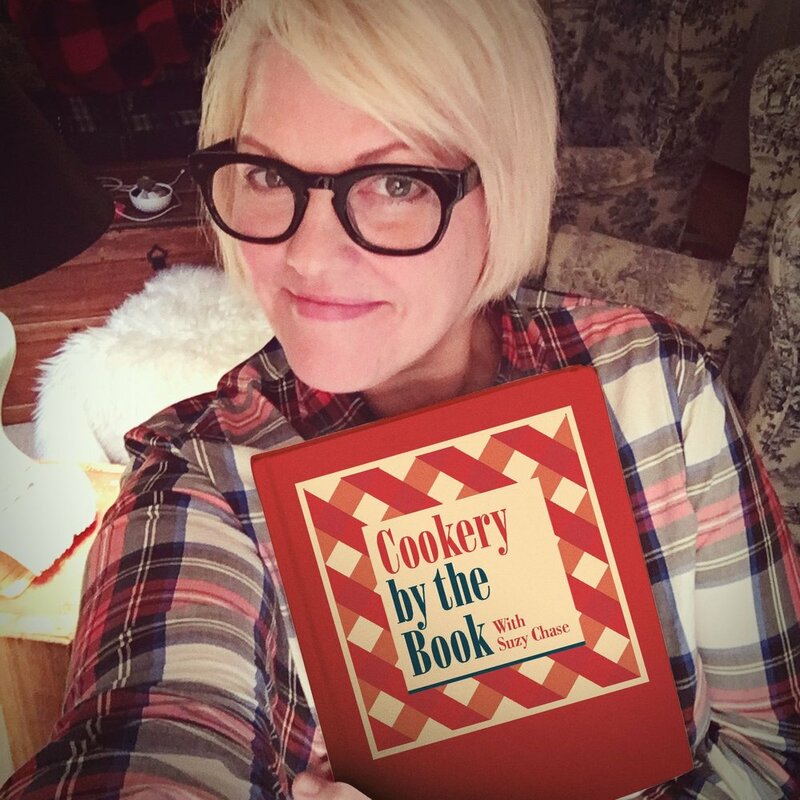 Suzy Chase: Thanks Elizabeth, for coming on Cookery by the Book podcast. Elizabeth: It was great to be here. Thanks for having me. Outro: Follow Suzy Chase on Instagram, @cookerybythebook, and subscribe at cookerybythebook.com or in Apple Podcasts. Thanks for listening to Cookery By The Book podcast, the only podcast devoted to cookbooks, since 2015.